Finalist for Best Gay Debut! Finalist for Best Gay Book! Finalist for Best Gay Paranormal Romance! 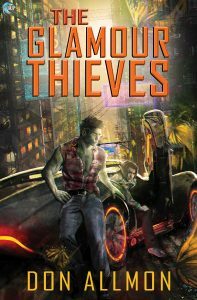 Huge huge huge congratulations to debut author Don Allmon whose THE GLAMOUR THIEVES rocked the 2017 Rainbow Awards! THE GLAMOUR THIEVES is available now and Book #2 – APOCALYPSE ALLEY – releases in early 2018.